Fluxbuntu Linux is yet another offshoot of Ubuntu. It uses a Fluxbox window manager because its main aim is to be fast, lightweight, and at the same time full featured. Accordingly, the primary objective of Fluxbuntu is to develop an operating system that would be ideal for older or low-end computer machines and even on mobile devices like cellphones and UMPCs. I got the ISO image of Fluxbuntu 7.10 i386 installer from HERE. I already have it a few months ago but time didn’t allow me to try it until recently. I used VMWare workstation for testing and utilized only 256MB of virtual memory to really find out how quick enough it is. So, here’s my blow-by-blow account of installing and then using Fluxbuntu for the first time. Once the ISO was loaded, I was taken to the familiar boot preferences screen. I chose to install Fluxbuntu right away without passing any parameters whatsoever. The installation begun immediately since it is not a Live CD installer. The installation is in text-mode only, but I considered the process very straightforward and almost the same or as easy as that of graphical installation. One difference is the many options it provided to help you out in configuring your system properly. Linux newbies should not worry as it is very easy to understand, and almost always the selected default option is the right choice. After effortlessly configuring my hardware like the keyboard, display, and network, followed by partitioning and password set-up, Fluxbuntu then took care of the system installation and was completely done in less than 30 minutes. I then rebooted and at the moment I reached the Fluxbox desktop, I considered the whole installation a success. My hardware were properly configured indeed, like my screen resolution was correctly set to 1024x768 and Ethernet was working straight away. Fluxbuntu’s look is very clean and light as seen on their boot menu, splash, and log-on screen images. The clean and light appeal can also be noticed on its project website. Fluxbox Window Manager (FWM) handled Fluxbuntu’s default desktop and can be pretty much credited for it’s responsiveness. The file manager is ROX–Filer. 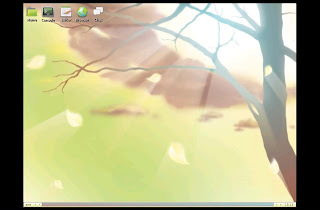 It is a minimalist or stripped-down graphical file manager with very plain functions. But, it does the job and it is pretty much easy to use. Those who are used to the sleek KDE or Gnome desktop may not like the overall look of Fluxbuntu, but those who are in for speed and simplicity may appreciate it. Fluxbuntu has limited number of pre-installed software applications, but they are mostly valuable and essential. The default web browser is called Kazehakase. You might not like its font rendering, but you can always install Firefox like I did. There’s AbiWord for word processing, Leafpad graphical text editor, and Nano console text editor. For email, there’s Claws Mail which is very lightweight but can do what most heavyweight email clients can. For programming, there’s Python and for system administration, there’s pppconfig(ncurses PPP setup tool) and several server applications as well. ImageMagick handles image viewing while VLC is for playing multimedia files. I would like to point out that some useful non-free software and codecs are not included out-of-the-box. Despite the inadequate number of applications available, its graphical Synaptic Package Manager will let you effortlessly download and install additional packages straight from the vast Ubuntu repository. 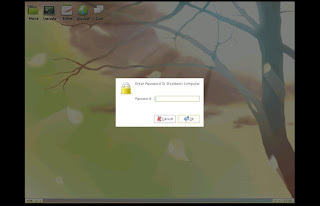 You can also use it for updating and removing software applications. The other glitch is that the ‘Menu’ does not auto update after an application installation. Like, after I installed Firefox, it is nowhere to be found on the menu options. I tried ‘sudo update-menus’ but unfortunately it did not fixed the problem. These are just minor setbacks and I think they are totally forgivable as Fluxbuntu is still on the development stage. Fluxbuntu is a must try Linux distribution which I feel has a very bright future ahead. I think new to Linux users will be able to handle it well with minor trouble. But, it might take some time for them to get used to its Fluxbox desktop. Meanwhile, advanced users will love it for its speed and versatility. 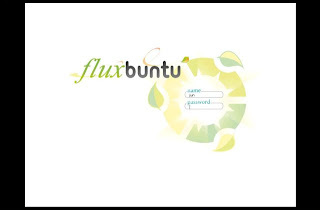 All in all, Fluxbuntu is very much like Ubuntu. 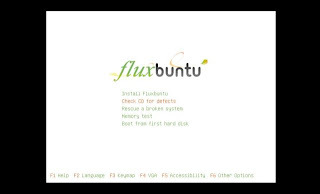 Those who want to try Ubuntu but can’t because of hardware limitations will definitely be fulfilled with Fluxbuntu. Those who have higher-end machines but are into speed and performance might want to consider using Fluxbuntu, as it is definitely lightweight and can make anyone’s powerful computer fly. I totally agree on what is advertised about Fluxbuntu Linux: Lightweight. Productive. Agile. Efficient. Ubuntu. Excellent and well written review. Linux needs this kind of article. I'm also using Fluxbuntu RC and I've been waiting for the final release to come out. I hope it will soon. Thanks Rick for the comment. I appreciate it. judging from the screenshots, it seems it doesn't load any gtk theme by default. lightweight should not sacrifice beauty. i'd hope they'd change that.